Honda Care for your Honda Pilot. Factory backed coverage. If your Honda Pilot is a 2016 or newer and has less than 36,000 miles, it qualifies for Honda Care. Honda Care is the only extended service contract for a Honda Pilot backed by and endorsed by American Honda, the people that built your car. Honda Care for your Honda Pilot is honored at every single Honda dealer in the United States. You can even use it in Canada. Honda dealers all across the country will honor Honda Care, regardless of where you purchased it. Claims are paid to the dealer directly by American Honda much like regular warranty claims. If you have a zero deductible plan, all you´ll need to do is to sign the repair order for covered repairs. It couldn't be easier. This plan offers you exclusionary coverage for your Pilot. This means that there really is no list of covered items. Everything is covered, except for those items in the short list of not covered items. If you have a problem and your Honda Pilot needs repair when you´re more than 100 miles from home, Honda Care will provide up to $100 per day, for up to 3 days, for meals and lodging. Should the need arise, we’ll be there to help you on your way. Whether you get locked out of your car, run out of gas, get a flat tire, need a jump start or just need to be towed, help is just a phone call away. Honda Care will reimburse you up to $35 a day, for up to 6 days, should your Honda Pilot require any covered repairs. This benefit kicks in if a covered repair takes more than 6 minutes! There is no better coverage sold anywhere, at any price, for your Honda Pilot. Honda Care´s exclusionary coverage is so extensive that it will cover you whether you have a problem with your door handle or you simply lock your keys in your car. Honda authorized navigation systems, DVD players, XM radios and security systems are all covered. Honda Care even goes beyond the standard factory warranty for your Pilot, you´ll also get Roadside Assistance and rental car coverage which starts on the day you purchase the plan. You can cancel within 60 days and receive a 100% refund! You can transfer Honda Care to a new owner in a private party sale! You can cancel at any time and receive a refund for the unused portion! You can purchase Honda care for your Honda Pilot at any time within the original full factory warranty. However, the best time to buy is when your Pilot is still new and has less than 6,000 miles. This is when the longest plans, at the best pricing, are available. At this point, your Pilot could be covered as long as 8 years or 120,000 miles. Honda Care for new vehicles starts from the original purchase date of your vehicle with zero miles. An extended service contract is an important option for a Honda Pilot. With the high technology built into today´s cars, repair costs have risen dramatically and will continue to do so. With just one major after warranty repair, the contract could easily pay for itself. Honda is proud of its reputation for reliability and superior engineering. However, anything mechanical or electrical could eventually require repairs. 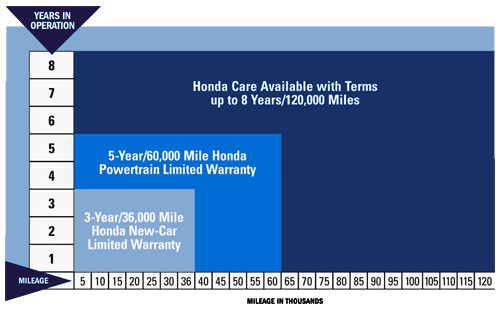 It may be difficult to predict how long you´ll keep your Pilot, but with Honda care you have options. If you decide to get a Honda Ridgeline and sell your Pilot while it is still covered, you can transfer the coverage to the new owner, after all, a used car with factory-backed coverage will command top dollar on the used car market. On the other hand, if you trade your Pilot for a new one or it's totaled, stolen or you just need the money, you can cancel Honda Care and receive a prorated refund for the unused portion. Honda Care VSCs can cover repairs for virtually every component of your Honda Pilot even after the original factory warranty has expired. If anything should go wrong in the vehicle´s drivetrain, the navigation system, even the stereo, Honda Care can cover the repair, potentially saving you thousands of dollars. That is the peace of mind you can have knowing you are covered for the unexpected. We are a franchised Honda dealer offering Honda products nationwide.